1 of 8 Hot-glue styrofoam rings together to get a double thickness. Cool. 2 of 8 Using a small serrated knife, cut a 1/2-inch bevel from one outer and one inner edge of wreath. Discard trimmings. 3 of 8 Cut foil into 12 x 3-inch strips. Wrap strips around styrofoam wreath, making foil as smooth as possible. 4 of 8 Line a cookie sheet with wax paper. Place foil-covered wreath on wax paper, flat side down. Unwrap mints. 5 of 8 Spread some Royal Icing around outside edge of wreath and make smooth. Press starlight mints into frosting, flat side against wreath and very close together, all around base of wreath. 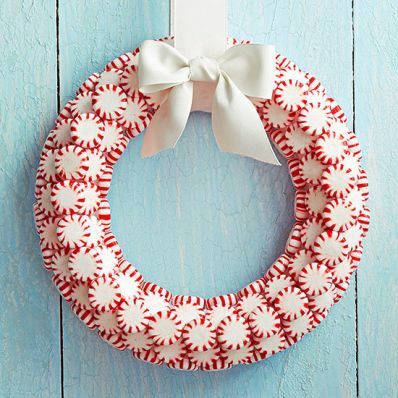 Spread some icing around inside edge of wreath and repeat method with starlight mints. 6 of 8 Spread more icing on top of wreath, making sure to cover foil, and add 2 more rows of mints, very close together. 7 of 8 Spoon remaining icing into a ziplock bag. Press out excess air and seal bag. Snip a small (1/8-inch) corner from bag. Pipe a dot of icing on a flat side of a mint and place as a top row of mints, covering any large gap. Repeat with remaining mints and icing. Let wreath dry in a cool dry spot until frosting is firm, at least overnight. 8 of 8 Thread ribbon through wreath to hang.